・After opening the basement door, light Rod of Sacrifices bonfire. ・Go down the hill and you will find a Shriving Stone surrounded by stones. ・Near the overturned coach you can find a Soul of an Unknown Traveler. ・Drop down from the ledge and at the bottom level there will be the Brigand Twindaggers. Go up the hill for Brigand Set. ・Kill the enemy NPC to obtain the Butcher Knife. ・You can loot a Brigand Axe near where the NPC spawned. ・On the stone bridge there will be a Titanite Shard. ・From the archway, make a right and drop down a ledge and you will encounter 2 dogs waiting for an ambush. You can find the Braille Divine Tome of Carim and Morne’s Ring. ・Cross the stone bridge and go up the mound to your right for an Ember. ・Make your way through the large gate and light Halfway Fortress bonfire. ・There will be 2 NPCs, Anri of Astora and Horace the Hushed where the bonfire is. ・Talk to Horace for Blue Sentinels convenant. ・Proceed down the hill to an open area. ・Drop down the ledge on the right side for a Soul of an Unknown Traveler. ・Near the mushroom monster you can find a Titanite Shard. ・You wil find another Titanite Shard near the crosses. ・Twin Dragon Greatshield is located next to a tree. ・Near the platform where the bonfire is, there will be a Fading Soul. ・Go up the platform and light Crucifixion Woods bonfire. ・Make your way into the swamp area and you will be invaded by Dark Spirit Yellowfinger Heysel. Defeat him to obtain the Heysel Pick and the Xanthous Crown. ・Walk along the right ledge for a Titanite Shard. ・Defeat the giant crab which is closest to the Black Knight for the Great Swamp Ring. But be aware of the crab as it is a very tough enemy. ・Also in the swamp you can loot the Grass Crest Shield, 4 Green Blossom, Great Swamp Pyromancy Tome, 2 Green ・Blossom, the Fallen Knight Set and the Conjurator Set. ・The door to the right in a building located far right of the swamp is locked. ・Walk along the hallway for the Sellsword Set. A strategy to fight against the Black Knight is to circle him counterclock wise and look for a chance to parry or to back stab him. ・Go further where the Black Knight was for the Sellsword Twinblades and the Farron Coal. ・From the bonfire, instead of going into the swamp, head towards the left building and you will find a purple summon spirit Mound-Maker Holy Knight Hodrick. By the fire you can find a Ember. Go further to an dead end for a Estus Shard. ・Look for a hole in one of the walls to enter the building. There will be lots of hollows so it is best to pick them off one by one at the entrance. ・Beneath an overhang there will be a Heretic Staff. ・Go up the stairs and behind a pillar you can find the summon sign of Eygon of Carim. Drop down a hole by a pillar for Sorcerer Set and Sage Ring. ・Go up the path for the Crystal Sage boss fight. ・Go back towards the building and go into an opening and find Orbeck of Vinheim. ・At the opposite side of him there is 2 Blue Bug Pellet. ・Make your way back to the doorway and at the end of the hallway and go down the left stairs for a Crystal Lizard. ・Make your way into the next room and from the 2nd floor balcony drop down for the Ring of Sacrifice. Go out from the 2nd floor and walk along the ledge for a Golden Falcon Shield. ・Go down from where the shield was for a Large Soul of a Deserted Corpse. 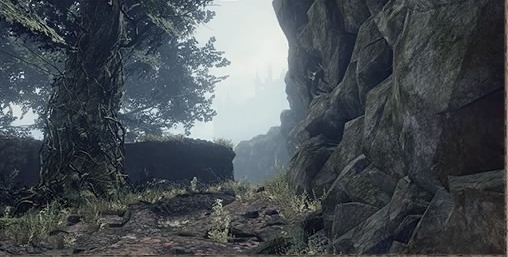 ・Head towards another ruined castle and you will find 2 enemy NPCs. Defeat them and they will drop a Great Club and a Exile Greatsword. ・Go up the stairs ahead for 2 Homeward Bones. ・From the Crystal Sage bonfire, go up the left hill. ・On your way, you can drop dow a ledge to find a Crystal Lizard. Kill it for a Twinkling Titatine. ・Make your way below the cliff to find another Crystal Lizard. Kill it for a Twinkling Titanite. ・Go down the hill and near the fire you can find the Herald Set. ・Light Cathedral of the Deep bonfire. ・Go up the stairs and you will find a enemy NPC. Defeat him for the Spider Shield. ・From the bonfire, make a left and you will find a man wearing a black robe wielding a dagger. Behing him you can find Paladin’s Ashes. ・Go up the stairs and at the wooded area to the left, there will be a Titanite Shard. From the right side of the stairs, drop down to a path and you will find the Creat Shield. ・Once up the stairs, you can find a Soul of an Unknown Traveler in that area. ・Go through the gate for Catheral of the Deep. ・After dealing some damage, she will dive underground and come back up at a different area. ・Dodge sideways for the crystals that appear from the ground. ・The homing crystal balls have high damage and can be destroyed by letting it crash into one of the pillars. 5 homing arrows can be dodged by running sideways. ・Rain of arrows will fall down on the place you were at while she puts her hands up in the air. ・She will punch you once you get close to her and guarding it will make her wince. ・When her HP gets down to half, she will spawn in a clone of herself. The on holding the purple crystal is the real one and the clones can be killed in one hit. ・She will most likely wince once she is hit and it is best to keep on attacking her. After defeating the boss in Cathedral of the Deep, go to Curcifixion woods and you will be invaded by dark spirit Yellowfinger Heysel. Defeat him for a Heysel Pick and the Xanthous Crown. Lingering Dragoncrest Ring+1 at the swamp in Curcifixion Woods.